Can two protein secondary structures “overlap” in the PDB? Now, as I understand the documentation, this means there is an alpha helix starting from residue "MET A 255" to the residue "ILE A 265". 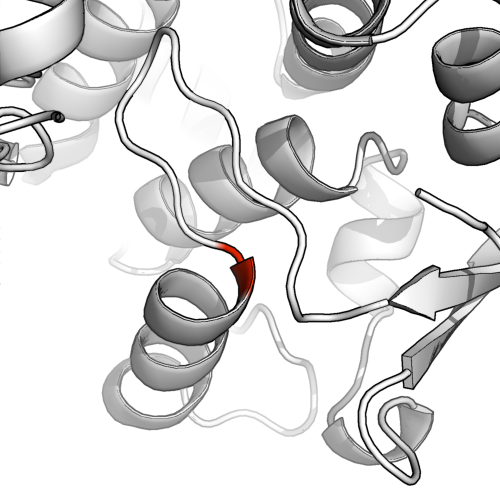 There is also a beta strand from "ILE A 253" to "MET A 255". We see that the alpha helix and beta strand share the residue "MET A 255". "Name of the initial residue." "Name of the terminal residue of the helix." The wording suggests that the "initial" residue is included, but I'm unsure of whether or not the "terminal" residue would be included. TLDR; Answer: You could consider this particular residue to belong to both structural elements, but it's a tricky call and depends on the method of secondary structure assignment. Ambiguous secondary structure allocation comes up fairly often. Whilst obviously, not many people will be able to use this protein specifically, the below approach could be useful for other proteins. 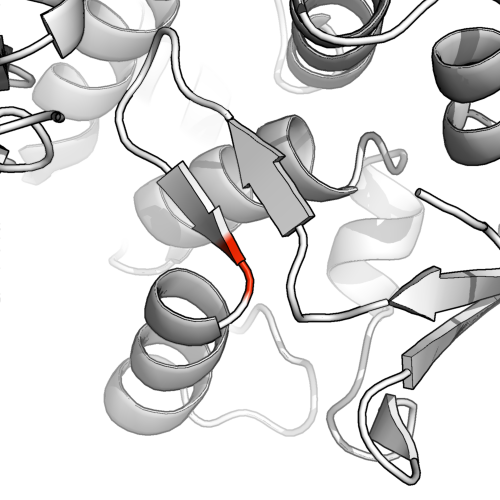 In PyMol I used fetch 1ae9 and highlighted M at position 255 on the A chain in red. I can see why this isn't a satisfying representation: the beta sheet allocation is very short, and the residue in question is clearly the beginning of a helix. 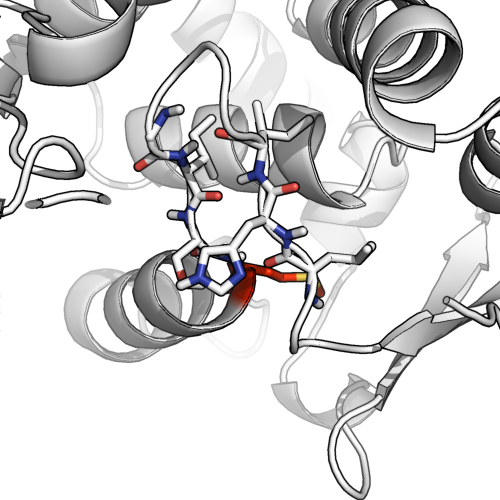 To run a more conservative secondary structure allocation run dss in pymol (watered down dssp). This reveals that the beta sheets were actually quite putative. We can see why when we look at the stick model (below). There are only a few (2-4) residue pairs in proximity that would be available for hydrogen bonding, even assuming all 4 form H-bonds, calling this a bona fide beta sheet could be seen as a bit generous. Dual assignment can be okay. Looking at this example (1ae9), we see the potential for H-bonding with another putative beta sheet, as well as a backbone angle that starts to form a helix. It's a classic case of ambiguous dual assignment. @AlexanderDScouras draws a reasonable conclusion that both is okay and to directly answer the question: dual assignment is possible, and allowed. I would prefer to rule out beta sheets in this particular case, but on the condition that one highlights that there is plenty of hydrogen bonding in the hairpin loop. So long as it's reasonable. So long as you can reasonably justify the assignment it's probably okay. You can manually assign any residue and secondary structure. # update the scene in PyMOL to reflect the changes. Evidence is always a good idea to support manual assignments. A quick and thorough way would be to run the sequence through a few secondary structure predictors, or use the genesilico metaserver to save yourself some hassle (you'll need an account) (this does feel like going back a step since you now have a structure, so exercise caution - if the sequence prediction doesn't look correct according to the structure, it's probably not). Another method as suggested by shigeta is running this through a Ramachandran plot (RAMPAGE is a favourite). If it's very very unclear then discuss it thoroughly and clearly whenever this part of the protein is relevant. These secondary structure assignments have somewhat arbitrary cut-offs after-all, and when things get near the thresholds, it's important to approach the situation with clarity and specificity. This is almost more a philosophical question about how you would like to define helices and sheets, which I would argue is not so well defined. 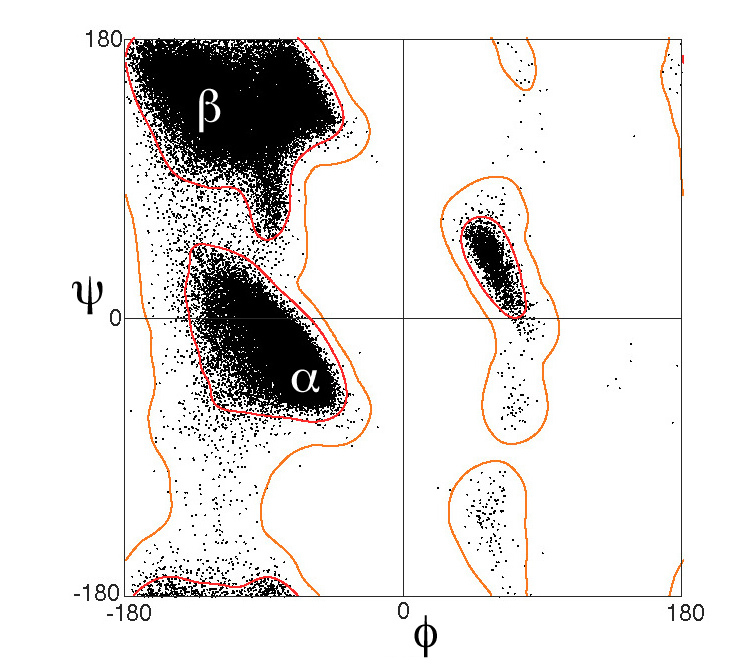 shigeta mentions that they have well defined ramachandran coordinates, but that's for the central residues. Terminal residues are far more flexible. The more traditional definition is along the lines of the DSSP algorithm, i.e. what is their main-chain hydrogen bonding pattern. The DSSP algorithm is a bit conservative about assignments, often leaving out the first and last residues in both sheets and helices. In deposited structures, you can compare author annotations to DSSP and STRIDE and see the authors will often assign longer runs than either. And I have certainly seen structures where a residue is annotated as both, especially when it lies at the junction between two secondary structure elements. Looking at the structure, residues 254 and 255 are clearly hydrogen bonding into a beta-sheet on one side and an alpha helix on the other, so I see no reason they shouldn't be annotated into both. Not the answer you're looking for? Browse other questions tagged bioinformatics proteins database structural-biology pdb or ask your own question. How do I prepare a PDB for submission to the Protein Data Bank? Where can I find pdb files for macromolecules like receptors? What is the secondary structure distribution per AA in the Human proteome? How to edit manually pdb structures?